Dear Reader, guess what my husband and I found on the Polly Ann Trail this week? A Little Free Library! “Take a book. Share a book,” is its motto. “What a surprise, a little library here in Leonard,” I said. Todd Bol of Hudson, Wisconsin, initiated this brilliant idea of a book exchange in 2009. He built a model of a one-room schoolhouse in honor of his mother who taught school and loved to read. Mr. Bol secured his little library to a post, put it in his front yard, and stocked it with books. His neighbors and friends begged for more. 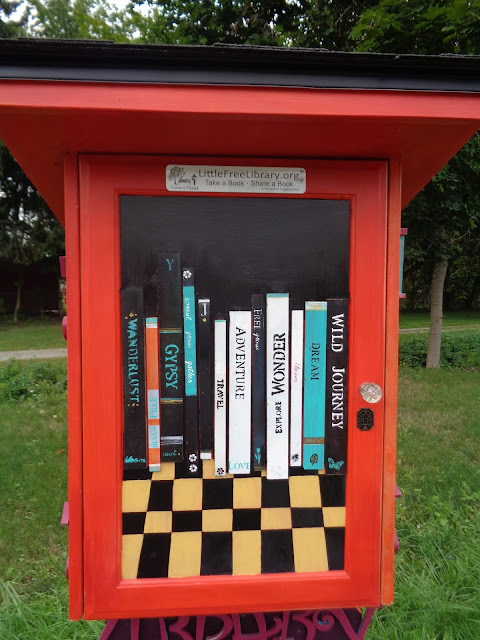 Today, over 75,000 registered Little Free Libraries in 85 countries bring communities together. Jaema Berman, a friend and Director of Addison Township Library, said that’s exactly what happened when she met with the library board a year ago. A “huge fan of the Little Free Libraries”, she discussed the project with the members. “I’m your man,” volunteered Brian Howarth. I stood before his finished product, painted by Kara King, a fellow township resident. I recognized Kara’s similar bold colors and book motif she used to identify the outside of our big (relatively speaking) library located on Rochester Road in Lakeville. The Little Free Library fit into the trail’s landscape with Leonard’s behemoth patched-up and preserved mill. Literature and agriculture stood together in harmonious juxtaposition. I felt a rush of joy when I opened the door to two tiny shelves of books. “I’ll bring a book to swap next time we walk the trail,” I said. Mel replied with a blank look. If this wasn’t enough excitement, within a stone’s throw of the Little Library, we recognized a copy of a painting by Aert Van der Neer titled Moonlit Landscape with a Windmill. Appropriately displayed on a post close to the mill, the Detroit Institute of Art’s Inside-Out trademark tagged the replica. Another bright idea. A peaceful image to begin our walk. I’ve seen other DIA Inside-Out paintings on Macinac Island and several buildings throughout the Metro Detroit area. The art typically represents the mood and characteristics of the place where it is installed. For instance, the lone walker in the foreground of Van der Neer’s moonlit silhouette of the windmill brought fresh synergy to our walk on the Polly Ann Trail. The Little Library, mill, and painting enhanced our experience in the natural world. At the end of the trail and a beautiful day, I certainly didn’t expect to find a covered bench awaiting us at the trail’s intersection at Bordman Road. Nor did we anticipate another DIA Inside-Out painting—The Lily Pond by Charles Harry Eaton, a relaxing and cool scene for thirsty and hot hikers. We sat and listened to squirrels chatter in the branches above us, and admired the skill and materials used to build the sheltered bench for our comfort. All these parts of our whole community welcomed us in an extended place we call home. And we say thank you.